Look at all that fabulous fabric, neatly stacked, bundled and bound in steel straps. Boy, I would have a tough time keeping my fingers from prying through the layers, pulling out bits of material here and there. 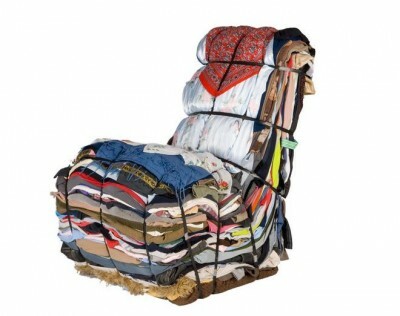 The Rag Chair is all about repurposing fabric, clothes or rags in new ways to create fun, interesting and really comfortable chairs. Designed by Tejo Remy, for Droog Design, the chair apparently sells somewhere between $4,500 and $5,000 but you should confirm that when you place your order. 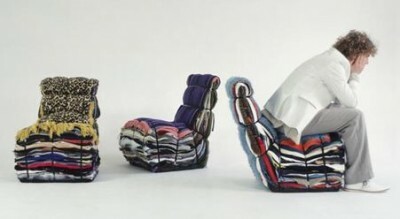 Considering that the Rag Chair is in the permanent collection at the Central Museum Utrecht, The Netherlands, and the Vitra Design Museum Weil am Rhein, Germany that’s not a bad price for functional art! It takes about 15 bags of rags to make a chair like this and it weighs in at 125 lbs. Wouldn’t it be fun to go through our closets and tie one up? It will be like making a time capsule for our kids to open up in 50 years…. even better than an old photo album! So what do you think?… If money were no object would you have one of these in your home? Hi Middlesis5… You’re funny! Hey thanks for stopping by! 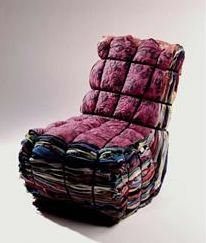 Previous post: Repurposed Interior Design – Are You Eco Conscious?